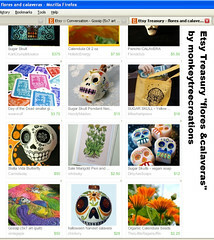 I'm in a Day of the Dead Etsy Treasury! Exuberant color or just really garish? I had planned to post this report last Sunday but our internet was out for a chunk of the day (horrors!). 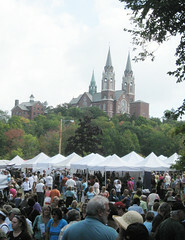 Last Saturday I attended the big Arts & Crafts Fair at Holy Hill for the first time. Fellow Ten Two Studios design team member Patti had a booth in the show, so I had to go check it out! 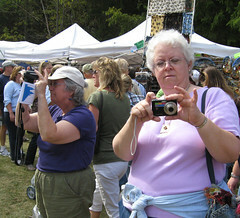 I met up with artsy friends Kathi and Ellie to brave the crowds. There were over 200 exhibitors, and we managed to walk BY every booth at least (we think). It was wonderful to meet Patti in person. 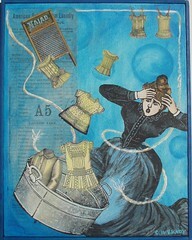 I met her and her husband Mark for dinner on Friday night, and we had fun gabbing about art & life. On Sat. 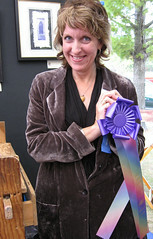 we stopped by her booth several times in our travels and happened to arrive just as she received a ribbon from the show organizers! 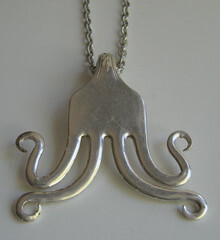 Patti does amazing things with repurposed materials. 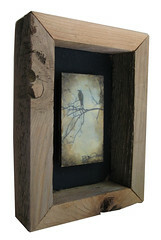 I bought this shadow box "Sentry" made with weathered wood from her kids' old playhouse and an encaustic collage featuring one of her photographs. My other purchases were this pendant made from a silver fork by Dianne Pecor (who coincidentally is a relative of Kathi's) and this fun paper mache Halloween cat bobble head by Monnie & Patrick Wilson of Manitowoc, WI. I also bought something from Dianne that I can't yet reveal since it's a birthday/Christmas present for my brother and his wife, but it involves silverware, a cat & fishes and makes noise. Ellie bought a bat-shaped garden ornament from Shari Grenzow Mauer. We also took scenic photos :D This was my first time visiting Holy Hill, but after all that arts & crafts walking I didn't have any energy left to climb the 178 steps to the tower for the full panoramic view. 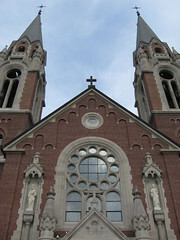 We took the elevator up to the basilica and then walked back down the hill afterwards. More photos in my Flickr set. 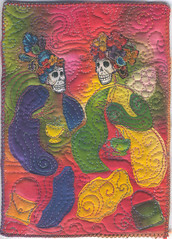 Big thank you to MonkeyTree Creations for choosing my little art quilt Gossip for her treasury Flores and Calaveras. Check out all the cool stuff she found! And be sure to visit her store and blog. Adorable stuffies! I've been so busy with non-artsy work lately that it's all I can do to write a blog post once a week! But I have been trying to get a little bit of art done every day. Right now I'm working on another Ten Two Studios design team challenge. 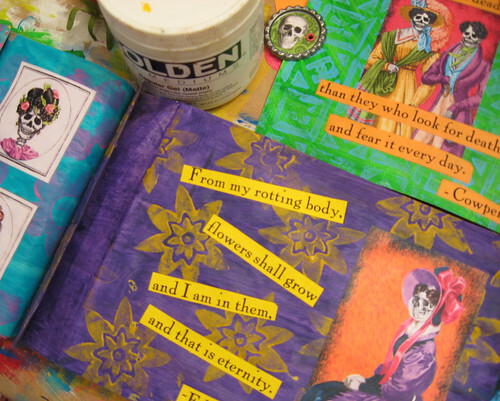 This time I have a waterfall paper bag book and some of the new eye-wateringly colorful Day of the Dead sheets. I LOVE 'EM! 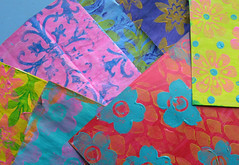 The bright color combinations inspired my backgrounds. I gessoed the paper bags pages & inserts so the lighter acrylic paints would show up more vividly and then added designs in contrasting colors with foam stamps. I don't think I've ever used orange, turquoise and lime green together before this! So far I've got the main imagery and the text laid down. Now it will probably sit for awhile until I decide what to do next! 1) Start cutting out interesting images from Smithsonian and National Geographic Traveler magazines. I knew I wanted fairy-tale setting backgrounds and people in costumes, but other things caught my eye too. 2) Glue backgrounds to poker cards (because they're ATC size :o) with a glue stick and start arranging my "characters"
3) Make a bunch of these magazine collages and then let them sit gathering cat hair for several days while I figure out what's missing. 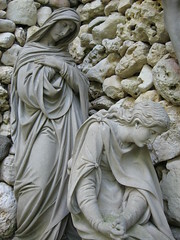 4) Decide to brush a thin layer of gesso over the images, leaving the faces exposed and the rest of the image still visible. 5) After the gesso dries overnight, recolor the images with Permapaque markers (because they have a slightly slower drying time, allowing me to rub and blend color with my fingers). 6) Leave these sitting on the dining room table for a day or two while I figure out what's missing. 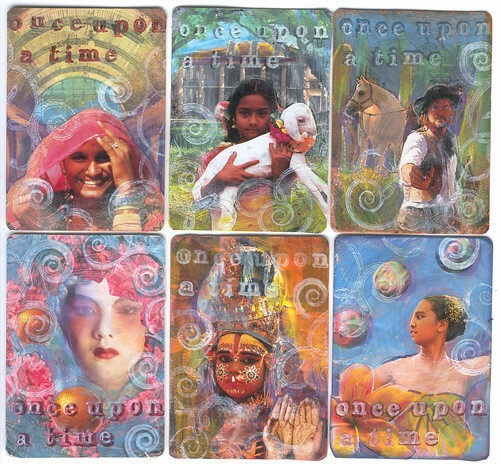 7) Stamp white curlicues and text "Once Upon a Time" on the cards. 8) Realize that the magazine paper is still just glossy enough that the pigment ink won't set properly so I experiment with a heat gun, which makes the magazine paper that was only attached by glue stick warp a bit in places (or maybe it was the plastic coating on the playing cards melting :o). 10) Flatten all the cards by sticking them under heavy books protected by wax paper. Honestly if I'd been trying to film all that at the same time, the cards would never have been finished! :D But I hope you will take up Annie's video challenge! This week, Lisa posted my book "Characters in Search of a Novel" at Ten Two Studios. 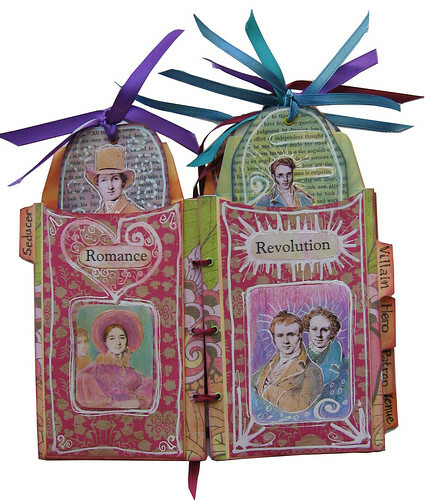 This was made for a design team challenge to use manila envelopes and tabbed pages, and I wanted to incorporate the Color Me Victorians collage set. 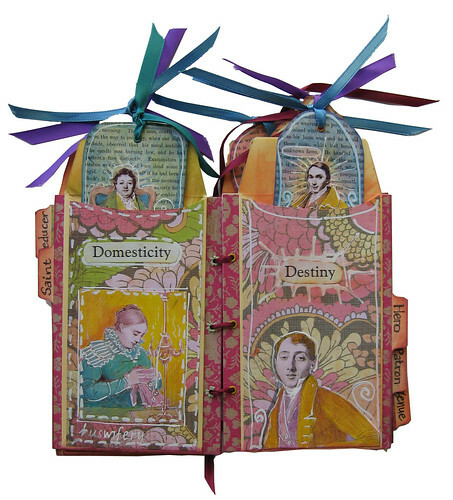 Each manila envelope is attached to a tabbed page and contains a character bookmark. I had fun assigning themes and archetypes. 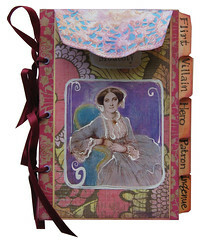 Some text was from the collage set; some I printed from my computer or wrote on the tabs: Romance & Revolution, Hero & Villain - all those archetypes. 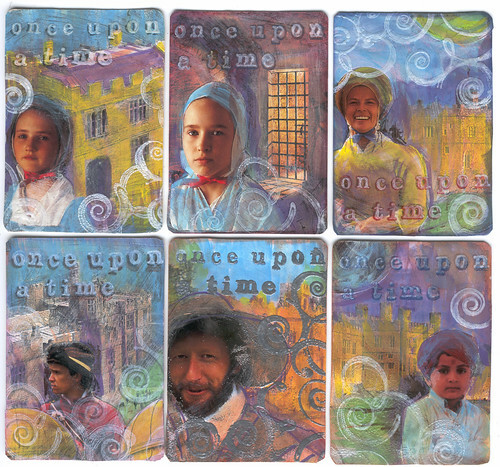 The best part, of course, was coloring all the Victorian sketches! Literary child's play? The background text on the bookmark tags was from an old copy of Silas Marner. All the fun of English literature without having to write a meaningful essay about it!